A deer in headlights is the way I would describe the expression on my face when my sweet but impulsive boyfriend showed up with a pudgy smelly puppy late one Saturday night. I tried to decipher how the pup I knew for a long time I wanted, but was too afraid to get, was gonna fit into my lifestyle. A dog after my own heart, Oliver's first month at home was an adventure and it somehow led to his blanket, toys and treats to invade my farmer's market tote. 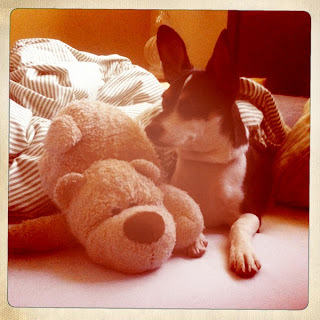 In desperate need of a solution, I searched numerous pet stores and dog boutiques for an on-the-go dog bag that was simple, functional and cute. Discovering it hard to find one that didn't look like a diaper bag or one that would break the bank, I decided to make my own. To get started, I turned to the web and found a site called Zazzle.com that allows users to create and buy all types of customized products online. Search the site for dog-themed totes and customize away. Don't hold back! Play with different bag colors, font styles and image sizes until you are happy. I was able to find a user, jennsdoodleworld, offering totes ranging from $12 dollars to $30 dollars. I created a simple canvas tote that included a silhouette of my dog, along with his name. Upon receiving the custom tote in the mail I still wanted to make it a bit more fashionable. Adding a simple bow and or a collage of buttons to any bag can do just the trick. Take a quick trip to your local fabric or craft store, you are sure to find some cute buttons and or ribbon. Don't forget to look in the clearance bin! You might be pleasantly surprised at what you may find. To make a simple bow accent, select three different ribbons, a yard each. I like to stick with a neutral color, such as black or a metallic, for one of the ribbon. Then select two other ribbon colors of your choice. The more unique the ribbon the better, but don't get too carried away because it could turn out looking like a cheap craft project. In other words, do not try to do a crazy color and funky fabric all in one ribbon. Also, when choosing ribbons, keep in mind that some ribbon fabric textures may be thicker and or more stiff than others, making it difficult to work with them. Take all three pieces and tie a bow around one of the front handle ends of the tote. Be patient and don't expect the bow to turn out perfect. Even after the bow is tied, manipulate the pieces carefully, arranging them until satisfied. Lastly, tidy up the ends, making sure they don't cover up the original design on the bag. I like leaving the ends, on the side farthest from the design, longer than the other ends, creating a quirky touch that makes the imperfection of the bow look on purpose. To secure the bow from becoming undone, sow the middle of the bow into the actual handle of the bag. 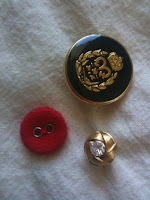 If you want to add some more detail, or are not fond of bow accents, you can create a cute montage of buttons. Find three different size buttons. As with the ribbons, refrain from selecting three over-the-top buttons. Pick one button to be the center of your collage. Complement it with two other simple ones, one which should be a neutral color to balance out the trio. When you have your selections made, pick a corner and sow them onto the bag. 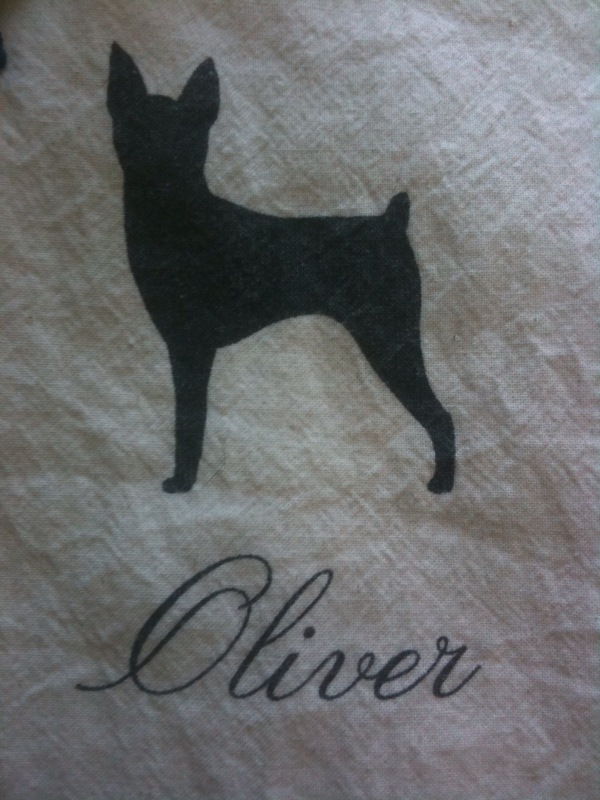 An ode to the Old French roots of Oliver's name, I decided to use a very bright red and navy blue Parisian color scheme for my own tote. I used red velvet, blue rope and black frill ribbon to create a romantic accent bow. When selecting my buttons, I fell in love with a big blue glossy shank button that had a gold outline with a gold crest in the center. Using it as my focus button, I balanced the regal button with a small simple red button and an even smaller neutral gold colored button that a tad bit of sparkle for fun. 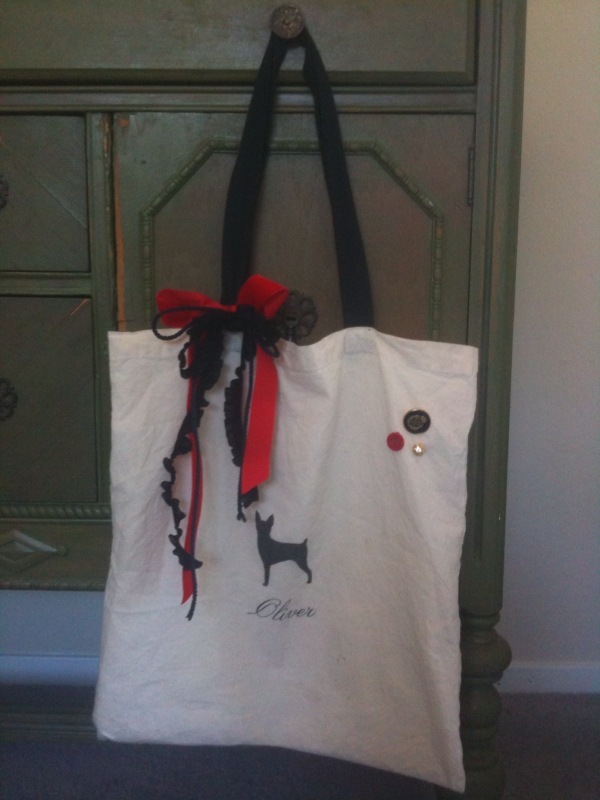 I love love love my doggie tote bag!